June 5 Bentsen Okay, DAYS LIKE THIS ARE DAYS YOU'RE GLAD YOU LIVE IN TEXAS. The great famous MARTIN REID was down from San Antonio to look at our famous FIRST-EVER-SEEN-IN-THE-UNITED-STATES, a PLANIPLAX Sp! 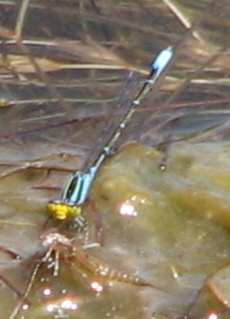 This, as you may recall, was first ID'd as a Neon Skimmer, then as a Flame-Tailed Pondhawk, and now after even more review of the photos from an even wider national audience, is considered a Planiplax, which of course isn't even in the book yet. We did manage two fast looks, but no photos. This beauty (half-red-half-black) is fast!! Then an ode Josh suspected at first, then Martin confirmed, turned out to be a FIRST-EVER-SEEN-IN-THE-VALLEY ANTILLES SADDLEBAGS!!! Then at the very end Martin once again came through and found another first: FIRST-EVER-SEEN-IN-THE-STATE-OF-TEXAS METALLIC PENNANT. Unbelievable. Josh, Jose, Jan, Dave, Tom, Martin and I outside in 100-degree heat in the full sun for four hours that went by like magic. Excuse me, I think my brain is melting and leaking out of my ears...."
June 7 I headed to Dixieland Park: Black-bellied Whistling-Duck 23, Northern Bobwhite 1 (first I've seen at this park! 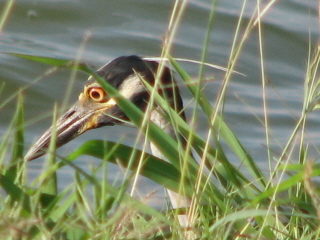 ), Pied-billed Grebe 4, Neotropic Cormorant 11, Great Blue Heron 2, Great Egret 1, Snowy Egret 5, Green Heron 6, Black-crowned Night-Heron 2, Yellow-crowned Night-Heron 1 (eating a crawdad), Turkey Vulture 2, Osprey 1,White-tailed Kite 1, Harris's Hawk 1, Swainson's Hawk 1 (Surprise! 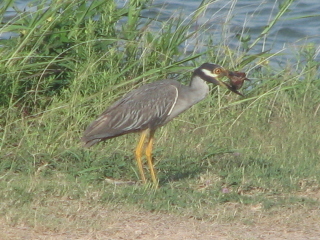 ), Crested Caracara 1,American Coot 3, Killdeer 10, Laughing Gull 22, Least Tern 2 (first at this park! ), Forster's Tern 10, Royal Tern 1, Rock Pigeon 2,White-winged Dove 16, Mourning Dove 29, White-tipped Dove 1, Common Nighthawk 1, Ringed Kingfisher 1, Green Kingfisher (first for this park!) 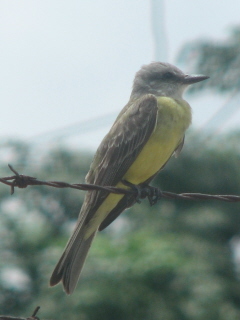 1, Golden-fronted Woodpecker 5, Ladder-backed Woodpecker 1, Brown-crested Flycatcher 1, Great Kiskadee 3, Couch's Kingbird 3, Scissor-tailed Flycatcher 2, Loggerhead Shrike five!, Purple Martin 6,Bewick's Wren X, Northern Mockingbird 8, Curve-billed Thrasher 2, European Starling 14, Olive Sparrow 4, Northern Cardinal 1, Pyrrhuloxia 1, Red-winged Blackbird 4, Great-tailed Grackle 72, Bronzed Cowbird 2, Lesser Goldfinch 1, House Sparrow 17. I had only been there an hour forty-five when it began to pour rain! The day had begun sunny and blue and it was only 10am! 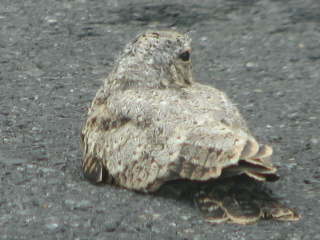 At Harlingen's Target, a baby nightjar fell out of the sky right onto the pavement by my car. I snapped a photo before it flew off. 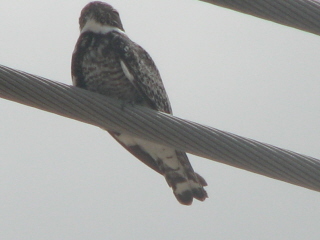 I drove around the parking lot a bit and did find a pair of Tropical Kingbirds harrassing a Common Nighthawk! In broad daylight! At home, the e-mail notified me that a red-billed tropicbird was seen at South Padre Island! We dashed out there and missed it of course. But we did see Black-bellied Whistling-Duck, Mottled Duck, Brown Pelican, Great Blue Heron, Great Egret, Snowy Egret, Tricolored Heron, Reddish Egret, White Ibis, Roseate Spoonbill, Clapper Rail, Common Moorhen, American Coot, Black-bellied Plover, Wilson's Plover, Killdeer, Willet, Ruddy Turnstone, Sanderling, Laughing Gull, Ring-billed Gull, Least Tern, Royal Tern, Sandwich Tern, Rock Pigeon, Eurasian Collared-Dove, White-winged Dove, Mourning Dove, Chimney Swift, Barn Swallow, Red-winged Blackbird, Great-tailed Grackle, House Sparrow and Chihuahuan Raven and White-Tailed Hawk enroute. June 8 Bentsen A Bird Walk right away this morning at "work" was great fun, with Jerry leading and me counting, as it should be: Black-bellied Whistling-Duck 4, Plain Chachalaca 1, Least Grebe 5, Pied-billed Grebe 25, Anhinga 1, Great Egret 1, Little Blue Heron 3, Green Heron 3, Turkey Vulture 10, Gray Hawk 1, Swainson's Hawk 1, Common Moorhen 3, American Coot 59, Killdeer 1, Black-necked Stilt 5, White-winged Dove 65, Mourning Dove 50, Inca Dove 2, Common Ground-Dove 1, White-tipped Dove 10, Yellow-billed Cuckoo 2, Groove-billed Ani 5, Lesser Nighthawk 3, Chimney Swift 2, Buff-bellied Hummingbird 1, Golden-fronted Woodpecker 18, Ladder-backed Woodpecker 3, Northern Beardless-Tyrannulet 1, Brown-crested Flycatcher 5, Great Kiskadee 8, Couch's Kingbird 15, White-eyed Vireo 1, Green Jay 11, Purple Martin 2, Cave Swallow 2, Black-crested Titmouse 6, Clay-colored Robin 3, Northern Mockingbird 14, Olive Sparrow 3, Northern Cardinal 5, Red-winged Blackbird 4, Great-tailed Grackle 180, Bronzed Cowbird 47, Brown-headed Cowbird 1, Hooded Oriole 1, Altamira Oriole 4, House Sparrow 4. 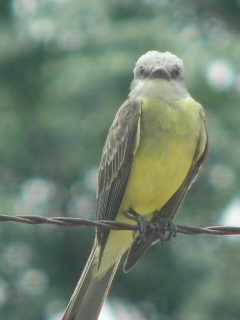 June 9 Quinta Mazatlan McAllenTX Josh and I went to look for the reported sulphur-bellied flycatcher but we missed it-- we only had our lunch hour to drive there, look and drive back. 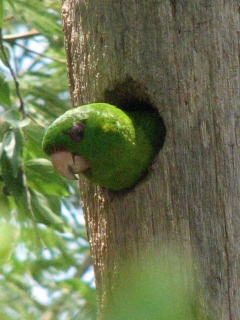 We did see really good Green Parakeets in their nest holes, as well as other nice birds: Plain Chachalaca, Killdeer, White-winged Dove, Mourning Dove, Inca Dove, White-tipped Dove, Green Parakeet, Yellow-billed Cuckoo, Buff-bellied Hummingbird, Black-chinned Hummingbird, Golden-fronted Woodpecker, Great Kiskadee, White-eyed Vireo, Green Jay, Northern Mockingbird, Long-billed Thrasher, European Starling, Northern Cardinal, Great-tailed Grackle, Bronzed Cowbird, Lesser Goldfinch, House Sparrow etc. I got to see some great baby Chachalacas there (my first for the season), as well as baby Javelinas at our own park of Bentsen (just tiny and red with a black stripe up there backs, also first of the season). 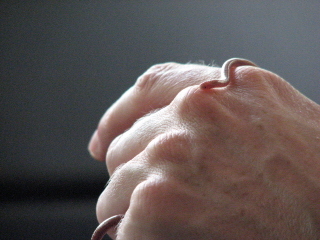 Jennifer found a South Texas Blind Snake, a tiny 6-inches at adulthood, that follows the phermones of ants and termites to eat their eggs and larvae. My very first ever! June 10 Josh, Jose, Carol and I went to Paul's (near 3-Mile on Bryan) to see his new 1.5 acre nature center he's starting. Checkered Setwings distracted us from the new plantings. Enroute we saw four Green Parakeets at the corner of Inspiration and Business 83, where I've never seen them before, very close to Bentsen park. June 11 The highlight was definitely a trip to Quinta Mazatlan in McAllen during lunch by Jose and me. We ran into Josh enroute back from a speech at Weslaco, and all three of us watched this Mexican visitor (SULpHUr-BELlieD fLyCAtChER) building a nest in a dead palm tree, and calling its squeaky toy notes! This was fantastic! 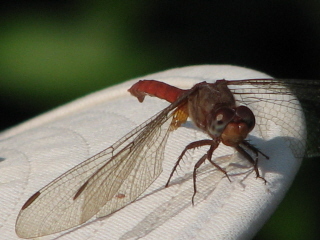 but the thorax was a deep red. We puzzled over its identity. It certainly was not the Planiplax which we later did manage to collect. 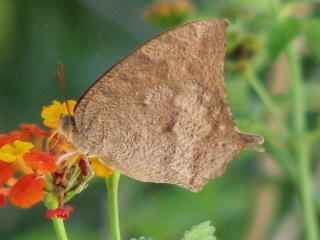 I suggested it might be Tauriphila australis Garnet Glider but consulting our trusty Needham, Westfall, and May, it's strongly curved cerci identified it as Tauriphila argo, a neotropical species not previously known to the U.S. The common name listed in NWM is Bow-tailed Glider.At our night program, Josh and I found TWO RHINOCEROUS BEETLES. 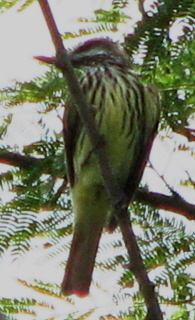 We have at least two Cuckoo nests, two Inca dove nests, two Kiskadee nests, and an Ani nest in the park headquarters gardens where we held all these activities-- I don't know why they choose to nest so close to people when there are 750 acres of solitude from which to choose. 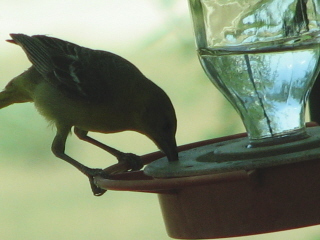 June 17 Bentsen I haven't been able to get out birding so they just started coming to me! 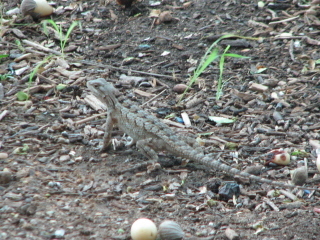 At my office door this morning for instance, a female Hooded Oriole sipping from the hummingbird feeder, a Tropical Leafwing at the butterfly bait (beer/bananas/brown sugar), and a Texas Spiny Lizard practically came on in the office! 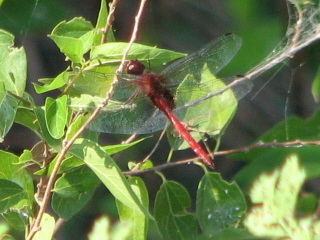 June 18 Bentsen Martin Reid collected the very first North American for the Claret Pondhawk, a female, the first female record for North America. 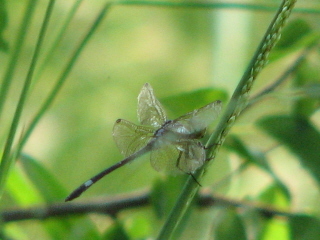 He also collected a Tauraphila argo (BowTailed or Argo Glider), and we saw many other species including the not-quite-as-rare-but-still-unusual Three-Striped Dasher. Some of these differences are so tiny... I got my first photos of all three, the rare Claret on Jan's hat! 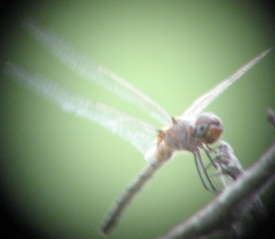 Afterward we did a Butterfly Count anyway, but I'm not sure how accurate it was since we interrupted constantly. We set a new heat record for the day, 103 I think. I stopped by at McAllen Nature Center after work. I'd never visited before, and it was extremely hot at 5pm, so I didn't explore very long. 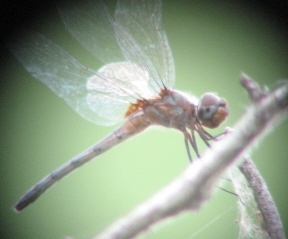 I was after the Golden-Winged Dancers and the Gray-Waisted Skimmers that Tom and the Dauphins advised are found here. 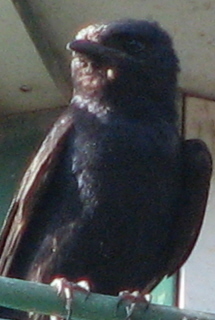 I was surprised to find Chachalacas, WhiteTipped Doves, Green Parakeets, and (unbelievably) actual Purple Martins in the Purple Martin house instead of House Sparrows and Starlings. 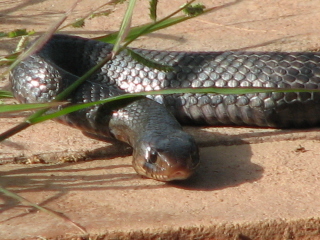 June 19 Bentsen On our way to the Hawktower right outside our office door was a threatened Indigo Snake-- chowing down on a Checkered Garter Snake! This was the first Checkered Garter Snake I've ever seen. 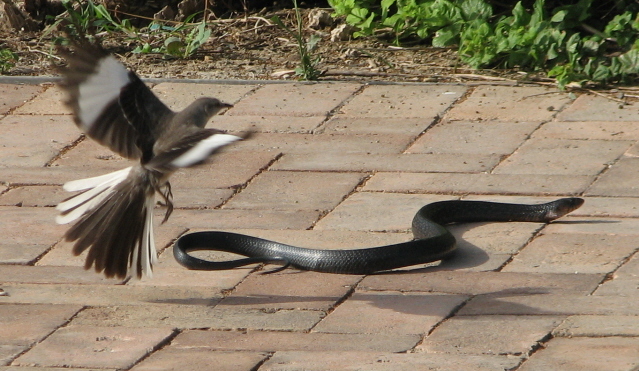 After the Indigo finished, it was promptly attacked by a Mockingbird and a Mourning Dove! Artemio showed us a great Cicada on the palm. I'm not familiar with South Texas species yet so I have to look it up yet. Our regularly-scheduled Dragonfly Walk went well, but nothing could possibly top the recently discovered first US records. What was nice was having novices just starting out. 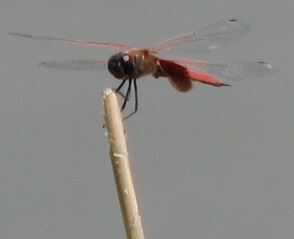 We got so many great views of great dragonflies I've come to take for granted, like the Halloween Pennant, the Caribbean Yellowface (found in only 5 counties of the United States) and already the Argos. 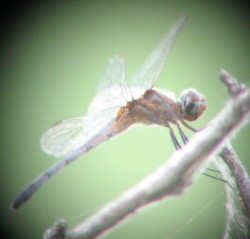 June 22 Bentsen was great, especially finding an EASTERN KINGBIRD that should not have been here today! Black-bellied Whistling-Duck, Mallard (Mexican), Mottled Duck, Plain Chachalaca, Least Grebe, Pied-billed Grebe, Great Blue Heron 2, Great Egret 10, Little Blue Heron 2, Green Heron 1, Yellow-crowned Night-Heron 2, White Ibis 9, Turkey Vulture 2, Common Moorhen, American Coot, Killdeer, Black-necked Stilt 50, White-winged Dove, Mourning Dove, Inca Dove, Common Ground-Dove, White-tipped Dove, Yellow-billed Cuckoo, Groove-billed Ani, Lesser Nighthawk, Buff-bellied Hummingbird, Black-chinned Hummingbird, Golden-fronted Woodpecker, Ladder-backed Woodpecker, Northern Beardless-Tyrannulet, Brown-crested Flycatcher, Great Kiskadee, Couch's Kingbird, Green Jay, Cave Swallow, Black-crested Titmouse, Clay-colored Robin 2, Northern Mockingbird, Long-billed Thrasher, Olive Sparrow, Northern Cardinal, Blue Grosbeak 2, Dickcissel, Red-winged Blackbird, Eastern Meadowlark, Great-tailed Grackle, Bronzed Cowbird, Brown-headed Cowbird 1, Hooded Oriole 1, Altamira Oriole, Lesser Goldfinch 2, House Sparrow. June 24 The dogs and I went to Harlingen's Dixieland Park instead, where we saw two RED-CROWNED PARROTS fly over, chattering all the way. EIGHT JACKRABBITS were way cool, as well. No one was at this beautiful park! Black-bellied Whistling-Duck 6, Mottled Duck 2, Pied-billed Grebe 3, Neotropic Cormorant 6, Great Blue Heron 1, Great Egret 3, Snowy Egret 10, Green Heron 1, Black-crowned Night-Heron 3, Yellow-crowned Night-Heron 2, Harris's Hawk 4, American Coot 2, Laughing Gull 10, Forster's Tern 1, Rock Pigeon 4, White-winged Dove 20, Mourning Dove 5, Inca Dove 1, Common Ground-Dove 1, Red-crowned Parrot 2, Common Nighthawk 2, Buff-bellied Hummingbird 1,Golden-fronted Woodpecker 1, Ladder-backed Woodpecker 1, Brown-crested Flycatcher 1, Great Kiskadee 1, Couch's Kingbird 3, Scissor-tailed Flycatcher 6, Loggerhead Shrike 2, Northern Mockingbird 10, Curve-billed Thrasher 2, European Starling 20, Lark Sparrow 2, Northern Cardinal 1, Pyrrhuloxia 1, Red-winged Blackbird 2, Great-tailed Grackle 22, Bronzed Cowbird 16, Brown-headed Cowbird 1, Lesser Goldfinch 2, House Sparrow 4. To see my history of birding before I moved to Texas just click one of these links: at Oxbow Lake, in Defiance County. at Independence Dam State Park, in Defiance County. the rest of Defiance County. at 16 and C in Williams County, in Northwest Ohio. I've also researched my genealogy a bit (my other hobby). Click here to learn about the Yochums.